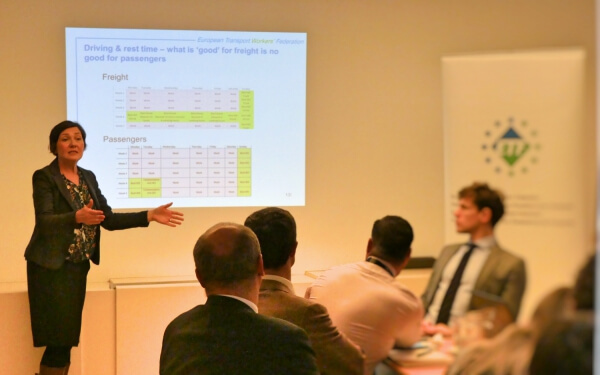 The ETF organised a breakfast meeting about the EU Mobility Package with diplomats responsible for transport at the Permanent Representations – the Brussels offices of EU member states. The transport attachés of 12 member states attended the event, which was hosted by Austrian trade union organisations OGB and Vida, in cooperation with the Austrian Chamber of Labour. The purpose of the meeting was to explain and discuss trade union perspectives on the Mobility Package, which aims to simplify European rules on road transport. ETF Political Secretary Cristina Tilling presented the ETF’s expectations and concerns for the reforms. She stressed that the revised rules must be simple, easy to control and effective in addressing the problems of the road transport sector. Concrete proposals from the ETF include an early mandatory introduction of the ‘smart’ tachograph, a device which can effectively and easily measure how much a driver works and delivers outside of their home state (so-called posted working and cabotage). On driving and rest time, the ETF highlighted the issue of weekly rest to be spent outside of the truck cabin and the need for a clear definition of ‘home’ as the drivers’ country of origin – not the location of the company employing them. The presentation raised a lot of interest among the transport attachés attending, and led to a fruitful exchange of ideas. The meeting was also a chance to recognise work that the member states have already done. The ETF welcomed the progress made by the Council, the EU body where member states redraft European legislation, in closing the loops around light goods vehicles. These are currently excluded from EU rules on international road transport, encouraging companies to use them to avoid regulation. The ETF also welcomes the Council proposal to tighten the criteria a road operator needs to meet in order to get an operating license for the EU. The Mobility Package will be a debated and finalised over the coming months, so we look forward to many more discussions with EU member states in 2018. Working together we can build a road transport sector that is safe and fair for drivers all over Europe.